You'll just love our colorful Sweatshirts. Each cheerful design is digitally printed in full color onto a 50/50, pre-shrunk white Sweatshirt. XXL & 3X: $39.99 ea. 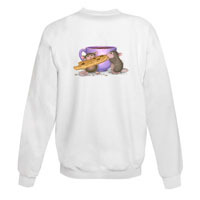 Click on any of the links above to check out our really "Mice" Sweatshirts.